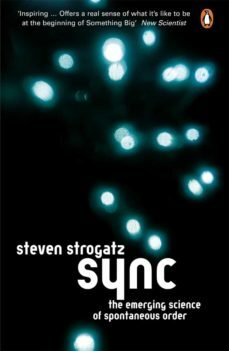 SYNC IS A STORY OF A DAZZLING KIND OF ORDER IN THE UNIVERSE, THE HARMONY THAT COMES FROM CYCLES IN SYNC. THE TENDENCY TO SYCHRONIZE IS ONE OF THE MOST FAR- REACHING DRIVES IN ALL OF NATURE. IT EXTENDS FROM PEOPLE TO PLANETS, FROM ANIMALS TO ATOMS. IN SYNC PROFESSOR STEVEN STROGATZ CONSIDERS A RANGE OF APPLICATIONS - HUMAN SLEEP AND CIRCADIAN RHYTHMS, MENSTRUAL SYNCHRONY, INSECT OUTBREAKS, SUPERCONDUCTORS, LASERS, SECRET CODES, HEART ARRHYTHMIAS AND FADS - CONNECTING ALL TRHOUGH AN EXPLORATION OF THE SAME MATHEMATICAL THEME: SELF- ORGANISATION, OR THE SPONTANEOUS EMERGENCE OF ORDER OUT OF CHAOS. FOCUSED ENOUGH TO PRESENT A COHERENT WORLD UNTO THEMSELVES, STROGATZS CHOSEN TOPICS TOUCH ON SEVERAL OF THE HOTTEST DIRECTIONS IN CONTEMPORARY SCIENCE.